One constant that you might have noticed lately in recent outfit posts are the bright colors. I'm usually a black, brown, muted, neutral wearing person but lately I've been addicted to color. Bright greens, blues, purples, corals and neon pink. I'm so in love with neon pink but it's such a bold color that some might want to ease into it at first. I've been easing in to it with bright finger nails and jewelry but finally feel brave and bought this pink skirt. For $16 it's an absolute steal! I plan on cutting it tea length but also thought about buying a back up and keeping it long. 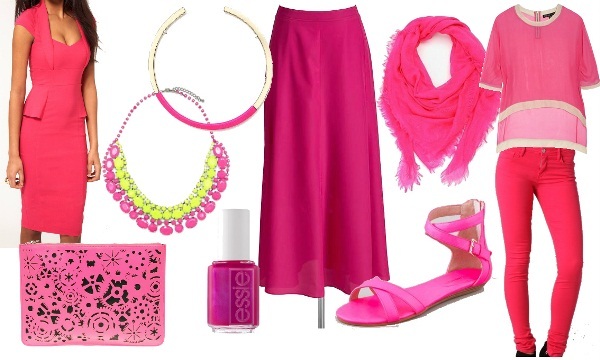 The skirt is so comfortable, light weight, easy to wear, and bright pink! Will you be trying the bold trend this spring/summer? I love the bright pink look! So fun and colorful! I'm totally smitten by bright pink so naturally this is amazing. that skirt is SUCH a steal. Of course my eyes gravitate to the most expensive thing...that top! I LOVE bright pinks, definitely a favorite color in my wardrobe! How amazing is that Asos dress? !